New place to play in L.A.
Los Angeles (CNN) -- For the first time in decades the Los Angeles River, once polluted and ridiculed, is open to kayakers and canoeists this summer under a federally authorized two-month program. Prior to now, the namesake river of the nation's second largest city was too contaminated for public recreation and was deemed off-limits -- but not for mockery and jokes over its condition. A state legislator opined in the 1980s that the river should be paved over to create yet another highway in automobile-addicted Los Angeles. Because vast lengths of the banks are lined with concrete, some locals belittle it as a "flood control channel." Now the river -- perhaps better known in the national imagination as a setting in such films as "Grease" and "Terminator 2" -- is enjoying a landmark step toward its revitalization. In what local conservationists say is a first in seven decades, the federal government has deemed part of the river safe enough for public recreation and is allowing residents to paddle along one of its most scenic portions, through a recreation area lush with trees, birds and even aquatic life. For seven weekends this month and in September, the U.S. Army Corps of Engineers is allowing the public to make canoe and kayak trips on a 1.5-mile stretch of the 51-mile waterway. The Corps' approval was required because the 1.5-mile segment is located in a flood-control area with a dam called the Sepulveda Basin Recreation Area, a 2,000-acre park in Los Angeles' San Fernando Valley. Until recently, the river was too contaminated for public recreation and was deemed off-limits. Under the pilot program led by the nonprofit LA Conservation Corps, paddlers drift downstream for 2 ½ hours along the sycamore- and willow-tree-lined riverbanks. The guide-escorted trip evokes a veritable back-to-nature retreat in the middle of L.A.'s notorious sprawl. "This pilot project reminds people that the river is here," said program coordinator Yasmin Mero-Corona of the LA Conservation Corps, which describes itself as "the largest nonprofit youth corps in the nation" working with at-risk young adults on conservation projects. For outdoor enthusiasts such as George Wolfe, the first federally permitted public paddling has capped one of many longstanding controversies surrounding the river. In 2008, he and two dozen other paddlers staged an unauthorized three-day journey down the entire river, to where it empties into the estuaries of Long Beach and the Pacific Ocean, he said. During the three days, he and two dozen kayakers paddled by day and camped overnight in backyards near the river. The controversial kayaking was worth it, because last year the U.S. Environmental Protection Agency placed the Los Angeles River under the protections of the Clean Water Act -- which helped lead to the Corps' permit for public paddling on the river this summer, said Wolfe, 47, of L.A.'s Venice neighborhood. "That was to demonstrate that the river could be navigable," Wolfe said of the 2008 river trip as he paddled his kayak down the river Friday. He is also president and founder of L.A. River Expeditions, which advocates environmental protections for the neglected waterway. "You know, three years ago, we were opposed to the same agencies we're now partners with," he added, referring to governmental agencies such as the Corps of Engineers. "There's an ironic beauty to it. For now, we're burying the tomahawk and working together." The nonprofit LA Conservation Corps and its partnering groups say they hope this summer's pilot project will spur federal authorities to issue another permit next year, with a longer season for the public paddling on the river. So far, public interest is insatiable: the Paddle the L.A. River program sold out its maiden season of 280 seats in 10 minutes earlier this month, officials said. The seats cost $50 each, and the money is used to offset equipment costs and insurance, said Mero-Corona. "The vision is to revitalize this river," even turning it in an annual tourist draw, Mero-Corona said. If so, the paddling will depend on the vagaries of Mother Nature. Famous for its sunny, mild weather, Los Angeles is located in a semi-arid Mediterranean climate zone, and the dry season leaves the long miles of concrete-lined riverbank with merely a trickle. The past year's heavy rainfall, however, nicely filled the portion of Los Angeles River in the Sepulveda recreation area -- enhanced by the three-mile-long dam, said LA Conservation Corps spokesman Mike Mena. Perhaps the ultimate vision for the river is held by Melanie Winter, director of The River Project, a nonprofit dedicated to restoring the river and its watershed. The Los Angeles River ought to be restored to its Eden version, with visitors being able to lounge under a willow on a sandy riverbank with a fishing pole angling for native steelhead trout, Winter said. With such grand goals, Los Angeles seeks to join the ranks of other major American cities that have made significant progress in restoring their signature waterways, such as Chicago, Denver and San Antonio, Texas. Local officials have been long working to turn the beleaguered waterway into a green belt, and in 2004, Los Angeles voters approved a $500 million storm-water bond to keep pollutants from reaching the river and eventually the Pacific. Urban runoff such as lawn fertilizers and oil from homes and business have contributed to the river's pollution, and Los Angeles' explosive development after World War II exacerbated that runoff, which has since been partly remediated by the $500 million storm-water bond under so-called Proposition O, Winter said. Local officials spent many years seeking funding and voter approval for river improvements and remediation, Winter said. At the same time, local environmental groups also spurred city and county officials to comply with Clean Water Act by winning a lawsuit in the early 2000s, Winter said. The city and the river are inexorably connected: Until 1914, the river was the city's main source of water, according to The River Project. By the 1930s, the U.S. Army Corps of Engineers lined much of its banks with concrete for flood control. By the late 1940s, the last native steelhead trout was caught. In the 1990s, the Los Angeles River was so sickly that the conservation group American Rivers placed it six times on the list of the country's 20 most threatened and endangered rivers, and, in 1995, it was named the second-most endangered river in the United States, according to The River Project. Such a dark history was hardly evident during a 1.5-mile downstream float held for journalists and other visitors on Friday. The river was teeming with plantlife and occasional wildlife. As guides advised paddlers before embarking, you never run the same river twice. That's because conditions and obstacles always change. As narrow as a few yards in some sections, the river often widened to 30 or 40 feet in some portions, where blue damselflies hovered above a surface colored iridescent green by patches of duckweed. Kayakers and their guides spotted mallards, night herons, egrets and a green heron in the waterway -- which is home to a more than 200 species of birds, including the American coot, great blue heron, belted kingfisher, yellow warbler, red-winged blackbird and cormorant. Channel catfish and mosquito fish populate the river, though none happened to be sighted during Friday's trip. The river also supports the western pond turtle, red-legged frog and tree frogs. One plant is colorfully called the sticky monkey flower. It features sandbars and other hazards for kayakers and canoeists: obstacles dubbed "cattail chute" and "rocky rapids" required direct help from Mountains Recreation and Conservation Authority rangers Fernando Gomez and James Latham, who helped supervise the journey. One stretch is audaciously named Los Angeles' version of "the grand canyon," where a two-story cliff of sand and earth rises dramatically above the riverbanks. For all its beauty and bounty, the river still clings to its uglier days: One bank displayed a partly buried shopping cart. 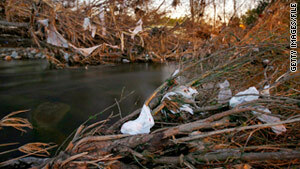 The more prevalent reminder were plastic bags, suspended like infant phantoms in the branches of the cottonwoods, mule fat, and other trees. At the end of float, LA Conservation Corps guide Ignacio Garcia distributed a remedy to paddlers to combat the trash: re-usable grocery bags made of fabric, not disposable plastic.